Billiardoo Plus is a revolutionary software program that provides a complete solution for managing Billiard, Pool & Cafe shops. Billiardoo Plus unlike other software programs, is focused for Billiard, Pool & Cafe shops thus delivering exactly what is needed to run your business in the best & most efficient way. We understand the business requirements very well and most importantly we deliver what the business needs and not what we want to. Billiardoo Plus has a sophisticated, yet easy to use graphical user interface to manage all the functionalities related to the business. Its rich graphical user interface makes it user friendly & easy to use. Billiardoo Plus integrates with all the real world external gadgets essential to run your business thus providing a complete solution. The integration is seamless, Cash Drawer, Table Light Controller, Barcode Scanner, Receipt Printers & Windows Printers. 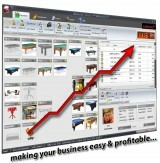 Billiardoo Plus helps you control your business more efficiently & effectively thus saving you time and money. It also prevents unauthorized use and potential loss of revenue due to fraud. The bottom line is, Billiardoo Plus is capable of doing all the things your business needs to make it successful & profitable.